Colleen Hoover’s books are ones that I always read in one sitting. They’re so short, and just so right for little fantasy genre breaks. I read November 9 in one of the mini long weekend breaks I had last November when I had extra time in studying and oh I loved the book so much. I discovered Colleen’s works just earlier this year when I first knew about the new adult genre. Being a YA sci-fi/fantasy/dystopian fan, I was never really that interested in reading adult contemporary books. But all of that changed when I read Maybe Someday last April. I fell in love with Colleen’s characters and stories, and that book made me include her in my auto-buy (& auto-read) authors list. If you still haven’t read any of Colleen’s works yet, you should go try them out. November 9 would be a great start. I went into this book blind. I never read the synopsis when I got the book because I was just so excited to read it, so I never really had any idea of what it’s about. And I’m so glad to have done it because I enjoyed the book so much. If you’re curious, this book’s about two people agreeing to meet each other on November 9th every year with no contact for the rest of the year. Just November 9th. This plot point is one of my favorites in the book, since it’s so unique and it made the book more fun to read. I found myself waiting for the next November 9th to happen, which is really crazy because each chapter is made up of each November 9th. 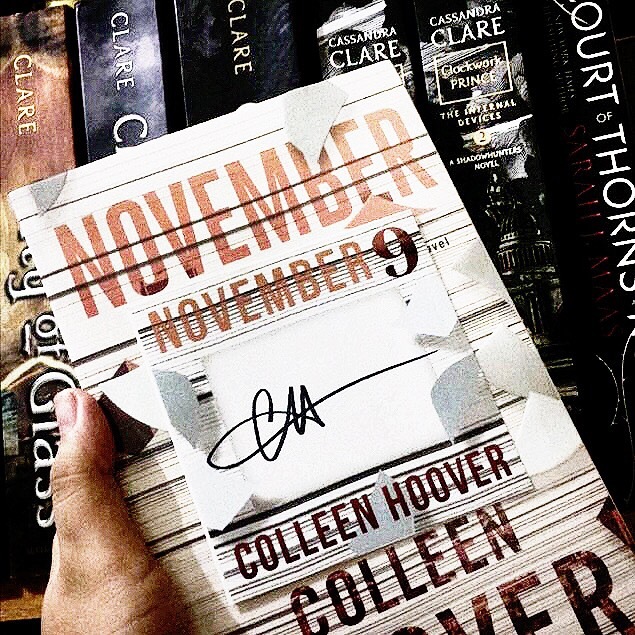 If you know Colleen Hoover, you’ll be set to know that this book would definitely have one of those crazy roller coaster ride of feels and plot twists. She always builds up the readers’ emotions and sends it going down the hill after a couple of pages. But this is one of the factors that I most definitely love about the way she writes her books. Since she also loves happily ever afters after putting her characters in so much pain, I consider that a plus point for my love for her as an author. Fallon O’Neil as one of the main characters in the book had a very beautiful character arc. She grew so much from the beginning of the novel up until the end. She found her self-confidence, regained it, and came back stronger, all because of a wonderful guy named Benton James Kessler. And Ben, oh Ben, as the other main character of the book was very swoon-worthy. He is an aspiring novelist and came to be with Fallon for every November 9th and used it as a plot for his novel. Fallon the transient, a reader, and Ben the writer. Tell me what could be more perfect than that? This book is literally about people who love books like we readers do. Every bookish-fangirl-reference these two had in the book got me laughing and loving every second while I’m reading. This would be a really great CoHo Starter Novel for everyone out there who hasn’t read any of her works yet. This book did easily make its way up on my Top 3 Colleen Hoover books after all. Believe me when I tell you, you are gonna love every bit of this wonderful book. Great review sis! I read what you thought about this becaause because it’s my favorite book this 2015. LAHAT NA SIS! Hahaha umattend ka ba nung pumunta sila dito? Hahahaha eh magaganda kase talaga lahat ng books niya 😍 Sadly, hindi 😭 May school event kase kami the day before, eh ayun, pagod, tapos yung kasama ko dapat, may make-up class 💔 Ikaw ba?